Needs additional fillers for draw/blockers, maybe the explore package as it works so nicely and can give you live for the lategame. The game would be less creature-focues then the pure golgari decks, but we would gain the spell recursion possibility. Is it worth splashing blue for the eventual Surveil and possibility to play the graveyard more? There is an absurd amount of removal and wipes recursion possible. I started playing Golgari and it's a blast to play as you have answers to everything, but as always, looking for something to upgrade. Maybe mill with Psychic Corrosion, Patient Rebuilding. We don't have enough blue to consider Drowned Secrets. I love Sultai and the reanimator aspect you can create with Muldrotha. I have been trying a Golgari-style deck with a touch of blue just for that, with a varied level of success. It's neither top tier nor fully mere jank, but somewhere in between. Perhaps with further brewing it can be (a lot) better. I would definitely add 1 Wildgrowth Walker for the toolbox. Counters the burn decks and you can recurr it easily if needed. I´m missing one Inmortal Sun... and one Muldrotha... I got just one MWC ATM... which one will you craft first? I had those in at first, but I opted to leave them out for the moment. I somehow don't really like to have Walkers as a 1-off... if I go that route, I would at least go for 3, because I would want to make sure to get one on time to gain life vs. mono red. But even with 4 Walkers in testing I found that it dies to a Lightning strike or Wizard's lightning more often than not before it can start growing. But to each his own and it may well work with just 1. I would go for Muldrotha first. - Carnage Tyrant, the top end of the deck is way to crowded and Tyrant is not the inevitability this deck wants IMO, I would rather have one Multani as Auunj suggested some time ago... I haven't tried it but I think is the right move. Axe! -Plague Crafter is great vs control but not so great overall besides for that effect we have Eldest Reborn. Axe! -Trashing Brontodon is all right, I mean the card is good but with Trophy I really don't see the point of this guy... Axe! -Immortal Sun is again competing on the top end of the curve and we really have all the family jewels there so Axe! - Vraska Relic Seeker... she is way to good to pass, I have my eye on her before rotation when I tried to build the Explore midrange deck. - Hostage Taker: Stealing creatures have always been one huge blow and the ability to do it over and over again with Multrota is insane, this girl is good and It's heavily underplayed IMO. So the deck is a real grinder, you will play and replay and replay your cards into oblivion which means that sometimes you have to suicide attack with the Lich coz Milling your self is not that hard. Interesting how you changed it, Cucho. I must say I recently switched from Bo1 to Bo3, because Bo1 is just way too much luck-based, and now I have a bit more knowledge on the meta and sideboards, and also enough cards for it. Hence my deck is more tuned to Bo3 than Bo1. -Carnage Tyrant: insta-win against many control decks, also very strong against Golgari-based midrange decks. I would never even dream of cutting it. -Plague & Bronto: fair points there. I liked them for the recurring ETB effects. -Immortal Sun: fair point too however, in the current meta I either play Planeswalker-heavy, or Sun. Right now I'm leaning on Sun, but I may step back to PW's. 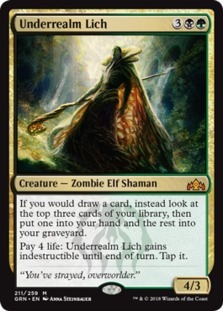 -Underrealm Lich: cool card, I have also had an eye on this one, I may have to try it out more. -Hostage Taker: my experience with this card is mixed, if you can play the stuff you steal in the same turn, it's nuts, otherwise it will eat removal next turn (which may be valuable), but failed it's prime function. And there's just so much removal that can hit it, that I did not consider it a bonus to this deck, but I may be wrong. Perhaps late game it really shines? Let me know how the deck performs after you did some more testing! That's my 1st go at the deck, basically my GB with added Muldrotha, Hostage Taker and Mirari. I don't have the Lich, so no testing for me. I dropped Findbrokers as they are slow and I'm planning on using Muldrotha and Find//Finality for GY recursion. Left my 2 reapers for the draw and exchange, I can get the life back with WGW anyway. I didn't touch the Walker Packge at the moment, but it can almost surely by optimized, a 2nd Vivien might be fine for the easy draw and killing nasty fliers. A lot of singletons for toolbox approach, the Explore package and WGW for filtering and against early aggro. Doom Whisperer would probably be my 1st cut and I'd add 2nd Vivien if I had her. Added a single Plaguecrafter for a swamp. Got 2 new rare lands, so also switched around. Still pondering if I should keep the Doom Whisperer, as it should be awesome with Muldrotha. I also added a 2nd Vivien in place of the Midnight Reaper they are kinda underperforming so far, although I really would like to play 2. Maybe cut 1 WGW? Don't really need more than 1 WGW, but always happy to have 1 at the start of the game. Or a Squire, I should somehow manage with 10 explore creatures that I can recurr and WGW might be useful to get life back against arclight or burn. the Explore package is great for getting you into the late game with lifegain and land draw. Filling the gy is sometimes slow as there are no Stitcher's Supplier or Glowspore Shaman but the Doom Whisperer should fill the role quite nicely and you don't need to fill the gy before you have Muldrotha out. Also, for anyone still considering if Carnage Tyrant is worth a spot in Golgari - at least 1 should be in every deck, it's awesome. What I would like to test is the Underrealm Lich but I used my mythic for Vivien as I need her in Stomp, Goglari and she's probably great in this deck too. Ok, so I cut the Doom Whisperer, wasn't useful at all. The deck is AWESOME, especially in mirrors. Just had a game where I cast Vraska's Contempt several times due to Mirari Conjecture, Muldrotha brings whatever you need back, multiple sweepers. I really like it. I didn't even cast planeswalkers to be honest as I had something to do all the time, so maybe the Immortal Sun approach is good. But other games Vivien or Vraska have been useful. But you always have something to do against your opponent. Ok, the sac effects are really bad most of the time, so -1 PlagueCrafter, -1 The Eldest Reborn, -2 Midnight Reaper. +1 The Mirari Conjecture, +1 Assassin's Trophy, +1 Find // Finality, +1 Vraska, Relic Seeker. Need more sweepers and uncodintional removal against PWs, the Reaper got the cut due to the walkers as they will ensure draw. I usually don't have anything to sac to little Vraska, so I will try the Big Vraska/Little Vraska setup. I feel like Sultai Control should basically be Dimir Control with a green splash for Assassins Trophy and Relic Seeker. I thought about it, but why not GB with a splash of blue? What list would you recommend? -1 Big Vraska, +1 Izoni for the toolbox and draw. Just took over an opponent's Izoni for 11 bugs, seems reasonable to test. Vraska doesn’t do much except being an additional removal and a wincon, but by the time the games is really in your favor. The problematic matchups are arclight, monoblue and monored. Except adding early removal and playing the whole explore package, what would you guys suggest? Unmoored Ego x1 in main? Actually running it in main would be funny. red without frenzy, jeskai without teferi or chemisters insight, blue without obesession/djnn, no arclight phoenix. Seems reasonable for 3 mana, but good luck having it in your hand at 1 copy, and more are a bit overkill. What does "during each of your turns" mean? Oh...of each permanent type. So you could play an enchantment, a creature, a PW etc? Yeah, 1 permanent type each turn. Combine it with Mirari and you can get the instants and sorceries back too. Mana for sultai is great, splash doesn’t affect the gameplay at all. You got an up to date list?